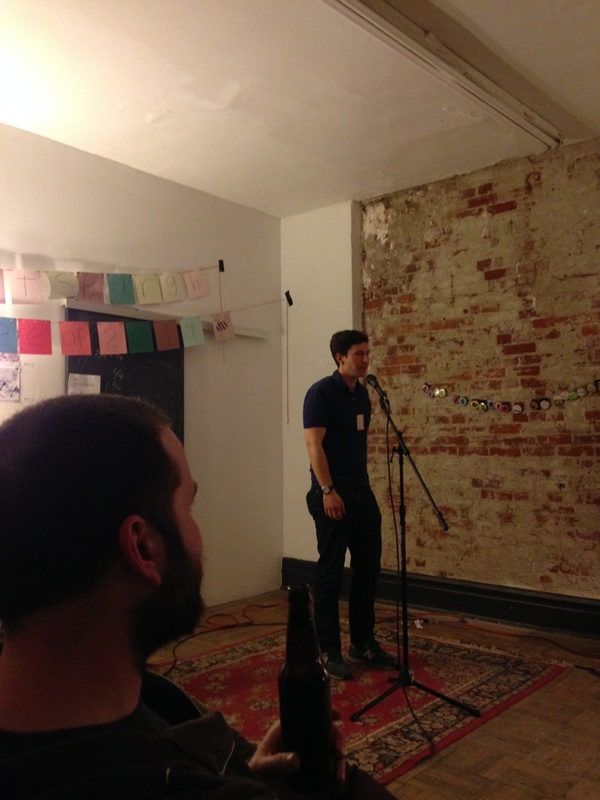 This weekend I had the good fortune of participating in the Great Pittsburgh Spelling Bee of 2014, which raised funds for the extremely worthy Literary Arts Boom (LAB), a project run out of an awesome Pittsburgh nonprofit, Assemble. LAB is Pittsburgh’s answer to the 826 writing centers project from McSweeney’s and fills the same niche of tutoring kids in writing, publishing, making reading and writing fun, and so on. A friend texted my fiancée and I about the spelling bee and, without too much reflection, I signed us both up. I should say that I have a history with spelling bees. I participated in my middle-school spelling bee every year I was eligible (sixth, seventh, and eighth grades). I still remember each word that knocked me out: “raunchy” in sixth grade (“rawnchy”); “dormitory” in seventh (“dormitary”) . . . and the last one I’ll mention in a moment. I love spelling bees; I love spelling. I always thought I was great at it in school, and I entered the spelling bee last Saturday feeling like I’d only gotten better over the ensuing years. Since eighth grade, I’ve graduated high school and college and earned a Masters degree in writing, and have accrued about a decade of experience as a professional proofreader, copyeditor, and writer. Still, I didn’t have any expectations. I basically took it on faith that somewhere in Pittsburgh there existed a medieval Latin-reading philosophy grad student, or a wizened old doctor who knew all the derivations of a thousand polysyllabic conditions and syndromes, or an insomniac librarian with a photographic memory, who would show up and dominate the field with the detached cool and confidence of a spelling assassin. I did better than I expected, and finished in second place. I spelled well, and handled some rough words (a partial list (patched together from memory) is below), but I’m not being at all modest in saying that luck played a huge role. A number of times a word like “aberrant” or “focaccia” came up for a fellow contestant and I grimaced as the speller did the opposite of what I would have done, which was to double the b’s in “aberrant” or the first c in “focaccia,” only to hear the judges announce that he/she was correct. There were also a number of really nasty words that I absolutely could not have spelled had I drawn them. Last year’s winner, a woman named Victoria who I judged to be the photographic-memory librarian of my earlier fears, handled some insanely tough words but went out (I think; I’m going off memory) on “myrmidon,” which I don’t think I’ve spelled correctly even now. I can’t remember the actual word but she was given something like “anthrogyny” (not a real word but in the same ballpark as the actual word) and after hearing the definition, which involved women, she nailed it, pronouncing the y in “gyny” with a little extra emphasis. When Victoria went down there was kind of a gasp in Assemble, followed by a huge round of applause (appreciative, not gloating; the crowd was really supportive and kind throughout). It was not unlike the feeling, during the NCAA tournament, when a few #1 seeds have fallen, and the tournament is suddenly way more wide open than anyone had dared to dream. There were a lot of really formidable spellers there, but Victoria was the one who, from the first round on, made me feel like I didn’t deserve to be there; a true spelling assassin. My luckiest round was during the one—it was maybe the eighth or ninth—that I’d call the Round of Death. There were maybe 10 spellers left at the start and when I went up (I was number 13 out of 23 spellers) I was one of three. Nasty, nasty words from the judges. Again I got very lucky: my word was “jodhpurs.” To my right, in the audience, I heard someone whisper, “This is a tricky one,” which actually helped me clarify my thinking: the question in my mind was where the h went: before or after the p? The idea that this was tricky only made sense if you thought the word could be “jodphurs,” but the “ph” combination made that spelling seem ridiculous (“jod-furs”? I think not). I spelled it out to the r, then suddenly freaked out that I wasn’t sure if it was a plural or not. I stopped, asked if it was “jodhpurs,” got an affirmative, and then spelled it from the beginning. Correct! Anyway, I was wrong about Victoria being the only spelling assassin in the group. I was fortunate not to realize it at the time, because I might have crumbled even more swiftly and absolutely, but the woman I was paired with in the final round of two, Maybe, was an unbelievably good speller. She initially went out on the word “praecipe,” but someone with an iPhone showed the judges that the alternate spelling she had used was accepted, and she was reinstated. (The judges did this two or three times and I admired their willingness to be proven wrong and to let contestants back in.) She also spelled “choriamb” correctly. It’s not obvious how hard a word that is to spell until you hear it pronounced—based on the judges’ pronunciation, I thought it would be spelled “coriam” (which is not a word). Standing at the microphone, she had to reason out that it was “chor-” as in “chorus,” and “-amb” as in “iamb.” On one or two of my turns I had to do a little reasoning up at the microphone, but really I just hoped that whatever word I got was one I’d encountered before. Thinking on your feet was the difference in the final round. The rules were like overtime in most sports: I’d go first and if I made it and Maybe missed, I won; the opposite, she’d win. I finally got a ridiculous word: “Zhdanovism,” which I spelled “Zdanivism,” which I’d say is a bad guess except that unless you know who Zhdanov was (I didn’t, and barely do now after looking him up) you’re not the kind of person who can reason out the spelling of a Russian surname while standing in front of 50+ people. If Maybe could have spelled her word—something that started with a u and meant “crunchy hair”—she would have won, but her word was also impossible. She missed it, although not by much. It was my turn again, and here I missed my best opportunity to win the bee. I got “apothegm,” which is pronounced “apothem,” which is how I spelled it. I told my friends later that I basically had no cognition while standing up there, and it’s true. Whether it was the increased pressure or knowing that I was in over my head, I just wasn’t very good at thinking things through during that final round. Nothing came to mind for that “-them” sound. I should have known a word in the final round would be tougher than “apothem,” and I did, except that I couldn’t think of what the trick might be and it seemed foolish to go adding g’s and h’s willy nilly. Maybe got “Nebuchadnezzar,” which was the first word in this final showdown that I’d heard before. I thought I could spell it, and I also thought Maybe would miss it. I was wrong (on both counts, actually, as a day or so later I typed it into a search engine “Nebuchednezzar,” which is how I likely would have spelled it in the bee). Maybe won, and it was well deserved. I was absolutely thrilled to have won second place. As the ranks of the remaining spellers dwindled to fewer than 10 during the Round of Death, I was pleased that I’d made it so far and thought it would be incredibly gratifying to make it to the last five or so. I’d seen a lot of great spellers felled by impossible words and knew I was very lucky to have made it this far. Much like the Great Pittsburgh Spelling Bee of 2014, I hung around in that bee (the only word I remember from that one is “chandler,” which I know because the bee was broadcast every afternoon on the school district channel and I’d get home right around that point in the bee and see myself shuffling to the microphone in my Warriors sweatshirt and pause long enough to hear myself spell “chandler” correctly, savoring this frozen moment when I was still alive in the bee) and survived until it was only me and one other speller. I don’t want to name that person here but she was one of the great brains of my class and had won the spelling bee the year before. She had an officious, overbearing mother who seemed always to be at school and who later moved to the town where this speller went to college so she could be nearer her daughter (who I probably don’t need to add was her parents’ only child). It was that kind of family, and she was that kind of student: serious, driven, and formidable. To be pitted against this speller at the end was kind of perfect; it’s exactly how a book or a movie would have played things. I was up first and was given the word “biopsy.” I spelled it “byopsy.” The other speller nailed her word and it was all over. At least in last weekend’s bee I made it one round longer than I did in 1994 (although I realize that’s only because Maybe was given a freakishly difficult word). Right now I’m not quite sure what to make of my having finished second again. I know if a classmate in a writing workshop or a student in one of my writing classes made that kind of artistic decision I’d write a note in the margin along the lines of “This seems a little ‘on the nose’” or “too convenient.” But life can be very “on the nose” sometimes. So far, the best lessons I can draw from this dramatic repetition are that I’m a good but maybe not a great speller, and that I’ve chilled out a lot since the eighth grade and am better able to value accomplishments and feel proud of them, rather than fixating on failures, and harboring feelings of intellectual insecurity over the next four+ years. Anyway, a terrific event, for a terrific cause, and fun was had by all. I got a couple of awesome gift certificates to Wild Card and Jerry’s Records, plus a Li’l Nut Case from Assemble. At the end one of the judges mentioned that they are going to try to hold a spelling bee every month. Hopefully that comes to pass, so look out for the next one.